Expansion of cargo at Inland Port Greer played a key role in Port of Charleston’s overall growth. SCPA opened a second facility, Inland Port Dillon, in April. A $370 million project underway at SCPA’s Wando Welch Terminal will increase capacity by 700,000 TEUs. The South Carolina Ports Authority posted strong performance across multiple business segments in fiscal year 2018, achieving new records for monthly and annual container volumes as well as progress of key capital projects. SCPA handled 2.2 million twenty-foot equivalent container units (TEUs) in FY2018, a peak in fiscal year container volume for the Port. March through June marked the highest months of container volume in the Port’s history. In breakbulk, or non-containerized cargo, Charleston handled 760,501 pier tons from July through June. Within the breakbulk business segment, SCPA moved 232,075 vehicles across the docks of the Columbus Street Terminal in FY2018. Expansion of cargo at Inland Port Greer played a key role in the Port’s overall growth. The facility handled 10,184 rail lifts in June for a total 117,812 rail lifts during the fiscal year. Success of Inland Port Greer was a driver in SCPA’s decision to open a second facility, Inland Port Dillon, in April. In addition to volume growth, SCPA achieved significant progress of key projects in FY2018. The nearly three-year effort to strengthen and refurbish the Wando Welch Terminal wharf will be completed on July 23, when all three terminal berths return to normal operations in conjunction with the commissioning of the terminal’s sixth ship-to-shore (STS) crane with 155 feet of lift height. By the end of the year, two additional cranes of the same size will become operational, with one additional crane to be delivered in late 2019, for the efficient handling of two 13,000 TEU or larger vessels simultaneously. A $370 million project underway at the Wando Welch Terminal will increase capacity by 700,000 TEUs by the end of 2019. Upon completion, the terminal will offer 13 STS cranes, including nine cranes with 155 feet of lift height; 62 rubber-tired gantry cranes and 23 empty handlers; 3,800 feet of wharf, capable of handling three neo-Panamax ships; an enhanced traffic pattern and 40 gates, including 27 inbound and 13 outbound, for continued efficiency and low turn times; and a new 35-acre chassis yard for the proposed Southern States Chassis Pool. Construction on the Charleston Harbor Deepening Project to 52 feet, which began in February, is well underway with three Great Lakes Dock and Dredge Company dredges currently at work in the Entrance Channel. The next construction contract will be awarded in the fall for dredging the harbor to the Wando Terminal. This contract will include widening the turning basin to 1,850 feet, a benefit that will be realized prior to the slated completion of this construction phase in March 2021. Beyond infrastructure projects, FY2018 also marked successful milestones in the expansion of SCPA’s cargo base and the addition of new facilities to serve growing markets. 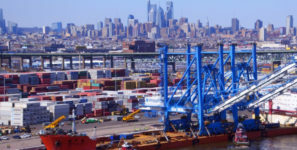 Frontier Logistics successfully opened a transloading operation on Union Pier Terminal in August to support growth of the Port’s plastics and resins business. Frontier has been operating in Charleston since 2011, handling bagging and seabulk transloading for both import and export resins and plastics producers. SCPA recently closed on the purchase of a nearly 950-acre industrial tract in Ridgeville, South Carolina to support import and export distribution growth. The rail-served site offers nearly 750 developable acres for port-related industry use. At their monthly meeting today, the SCPA Board approved a $53.8 million contract for construction of the wharf structure for Phase One of the Hugh K. Leatherman, Senior Terminal. The new terminal will open in 2021 to accommodate growth of the Port’s containerized cargo business.